Many Romans have written texts which may or may not be accurate enough for today’s researchers to accept their findings. This includes texts on surveying and general fieldwork. Analysis of the text by Vitruvius, (hopefully read by Octavian/Augustus Caesar even though it is not clearly nor definitively dedicated to him), has been carried out here-in in a similar manner to previous Roman/Greek texts on this website. That is by subjecting the descriptive text to a simple investigation of fact; trying to emulate what has been written and thus it ascertains if the author knew his subject, or, was writing from the material of others just to produce a new text. Why the original text has been written, can be evaluated from the authors own words, when he tries to hide his basic life and history, and juxtaposes descriptive text against his own partial data. He was an employee of the Roman State, probably an ‘Apparitore’ or latterly a ’Curatore’. Whatever he was the text has a fascinating storyline because we can relate to it as most people nowadays have building or DIY projects. But, we should be cautious and realise he does not fully understand all that he is writing about. Note: The various translations use a different numbering for chapters in the 10 Books. I have chosen not to number the Preface/Introduction as chapter 1, but when I use a single translation for a chapter, i.e. Gutenberg, I have kept to that numbering system. It is a matter of some controversy, but we do not actually know the correct or full name of Vitruvius, that of his parents, possible wife and children etc. We do not know where or when he was born, lived, and then died. From his text, estimates have been made of his active years and thus the possible birth date estimated to c80-70BCE. It is also therefore probable he died after 15BCE. Thus he was a contemporary of Marcus Vipsanius Agrippa, 64-12BCE, and his sister, Vipsania Polla, who were supporters and confidants of Octavian/Augustus Caesar, 63BCE to 14CE, to whom he addresses his 10 books. Historians, using so very little real data, have named him Marcus Vitruvius Pollio. The one factual statement Vitruvius makes in his text is that he is an old man whilst writing ‘De Architectura’. Others have named him ’Architect’, principally Frontinus (see Book 8) in his text ‘de Aquaeductu’, but in later research texts he is cited as an Engineer/Supervisor who may have designed and built Ballistae. Vitruvius is quite cunning in his use of text, he never states what his post or job was. He uses statements and descriptions side by side to give the impression he wishes to create. But, read his text carefully and it is quite easy to see that he was a state employee of the Roman Civil Service, for how else could his salary be commuted to a pension? Thus we must look to the cadre of state employees who were well educated in Art and Physics etc, and could be employed alongside specialists as supervisors, controllers of cash flow and use of labour. “We know very little more about the Roman civil service till we get down to the last 50 years of the Republic, when Cicero, particularly in the Verrines and in a letter to Quintus, gives us some interesting information, and the epigraphic evidence begins with a fragment of Sulla’s law on the 20 Quaestors, dealing with their ‘scribae, viatores and praecones’. With this evidence may be conveniently combined the many inscriptions of the Principate which illustrate the survival of the Republican civil service under the Empire. We hear at this period of many sub-clerical grades, doctors (medici), surveyors (architecti), haruspices to interpret omens, pullarii to keep chickens needed for divination, but we know little of the organisation and terms of service of these technical officers. Note, Verres’ medicus and haruspex are frequently classed with the apparitores by Cicero (Verr., II, 27, III, 28, 54, 137). Architecti and Pullarii are among the staff allocated to Rullus’ proposed ‘decemvirs’ (Cicero, de lege agr., II, 31-2). Only the last grade are known to have been organised on a regular basis in ‘decuriae’ (ILS, 1886, 1907, cf. 1926)” From Journal of Roman Studies, volume 39, 1949. The general cadre of public servants who were employed by Magistrates are known as “Apparitores”, so called because they executed the commands of those same magistrates within the fields of their own expertise. The Latin text is, “quod iis apparebant et praesto errant ad obsequium”, and their service or attendance was called ‘apparito’. However this changed under Augustus when there were commissioners entrusted with certain branches of administration, in public law, the Curatores. Augustus appointed several curatores and charged them with the admin or supervision of public institutions and works, which under the Republic was attributed to Quaestors and Aediles, such as public roads, curatores viarum; aqueducts, curatores aquarum and public buildings, curatores operum publicorum. These curators were also active in municipalities throughout the Empire. Thus the Curatores operum publicorum, officials for the management of public buildings, had a competency in the subjects of admin, leases, construction, contracts with contractors etc, and that competence was sometimes extended to other public institutions which found expression in their official titles as indicated above. It is therefore possible to opine that Vitruvius was employed as a Technical Officer, one capable of supervising or assessing the work of specialists such as ballistae constructors etc., and understand the techniques required, as well as controlling the labour force and budget. He was most certainly educated to a certain standard, and no doubt quick to grasp the technical details of so many differing aspects of Roman life. But, how much he really understood can only be established from a careful analysis of the text of ‘de Architectura’. Before the actual text is analysed it is necessary to comment upon the general tenor of the text and its peculiarities. We should also ponder the fact that most if not all Roman authors will, if possible, comment upon their family, and ensure their full name was available to posterity. Vitruvius does not, even to the extent of studiously not naming his family when in Book 1 he comments on the start in life they gave him. But, he then proceeds to name three compatriots he had worked with. Was this because their names had a greater resonance with Caesar than his own? We must also be aware that Vitruvius (or whomever) does not state in the texts many facts which he assumes his audience will be familiar with and therefore considers them un-necessary. Vitruvius also states at the end of sections of information that he will not explain further, for fear of overloading the data. This is a clever method of not explaining fully a subject of which perhaps you have limited knowledge, and limited data available. This is quite pertinent as Vitruvius often uses excessively long introductory texts preceding the data he wishes to explain and convey and can thus have better managed the writings to include more. Unfortunately therefore we cannot just translate the text and copy off the instructions. It is the background knowledge that is not stated, is missing, because educated Romans/Greeks were imbued with the geometry and science of their age and past ages. That is where some of today’s historians fail abysmally as they are not science based, not science minded and thus even simple mathematics and geometry when explained in texts are anathema to them, and the real history is lost. I am analysing the text via three on line versions and one book in my possession, thus hopefully the variety of words used by the various translators can be assessed to determine a single meaning for each sentence. They are set out in the same order (although not all are used all of the time) at each Book preface section as follows; Lacus Curtius; Gutenberg and Vitruvius.be are the on-line versions and Rowland/Howe is the book version. 1; Whilst, O Caesar, your god-like mind and genius were engaged in acquiring the dominion of the world, your enemies having been all subdued by your unconquerable valour; whilst the citizens were extolling your victories, and the conquered nations were awaiting your nod; whilst the Roman senate and people, freed from alarm, were enjoying the benefit of your opinions and counsel for their governance; I did not presume, at so unfit a period, to trouble you , thus engaged, with my writings on architecture, lest I should have incurred your displeasure. 1; While your divine intelligence and will, Imperator Caesar, were engaged in acquiring the right to command the world, and while your fellow citizens, when all their enemies had been laid low by your invincible valour, were glorying in your triumph and victory,-while all foreign nations were in subjection awaiting your beck and call, and the Roman people and senate, released from their alarm, were beginning to be guided by your most noble conceptions and policies, I hardly dared, in view of your serious employments, to publish my writings and long considered ideas on architecture, for fear of subjecting myself to your displeasure by an unseasonable interruption. 1; When your Highness’s divine mind and power, O Caesar, gained the empire of the world, Rome gloried in your triumph and victory. For all her enemies were crushed by your invincible courage and all mankind obeyed your bidding; the Roman people and senate were not only freed but followed your guidance, inspired as it was by a generous imagination. Amid such affairs I shrank from publishing my writings on architecture in which I displayed designs made to a large scale, for I feared lest by interrupting at an inconvenient time, I should be found a hindrance to your thoughts. I think it takes little imagination to recognize the necessity, when writing a series of ‘Books’, in Rome, in the first century BCE, that subservience to the Caesar was rather de rigueur if you wanted to impress not only Caesar but the upper classes of Roman society. This however appears to go beyond those bounds and states the books were written but not published because Caesar was to busy to read them and that was the authors prime concern. If Vitruvius could encourage Octavian/Augustus to become his patron then his place in history would be assured. That wish can be judged from historical facts. 2; When, however, I found that your attention, not exclusively devoted to state affairs, was bestowed on the state of the public buildings, so that the republic was not more indebted to you for its extended empire, in addition of so many provinces, than for your numerous public buildings by which its grandeur is amply manifested, I considered it right that no time should be lost in laying these precepts before you. My reverence for the memory of your virtuous father, to whom I was well known, and from whom, now a participator in council with the gods, the empire descended to you, has been the cause of your good will towards me. Hence, together with M. Aurelius, P. Numisius, Cn. Cornelius, I have been appointed to, and receive the emoluments arising from the care of, the various engines of war which you assigned to me on the recommendation of your sister. 2; But when I saw that you were giving your attention not only to the welfare of society in general and to the establishment of public order, but also to the providing of public buildings intended for utilitarian purpose, so that not only should the State have been enriched with provinces by your means, but that the greatness of its power might likewise be attended with distinguished authority in its public buildings, I thought that I ought to take the first opportunity to lay before you my writings on this theme. For in the first place it was this subject which made me known to your father, to whom I was devoted on account of his great qualities. After the council of heaven gave him a place in the dwellings of immortal life and transferred your father’s power to your hands, my devotion continuing unchanged as I remembered him inclined me to support you. And so with Marcus Aurelius, Publius Minidius and Gnaeus Cornelius, I was ready to supply and repair ballistae, scorpions, and other artillery, and I have received rewards for good service with them. After your first bestowal of these upon me, you continued to renew them on the recommendation of your sister. 2; But I observed that you cared not only about the common life of all men, and the constitution of the state, but also about the provision of suitable public buildings; so that the state was not only made greater through you by its new provinces, but the majesty of the empire also was expressed through the eminent dignity of its public buildings. Hence I conceived that the opportunity should be taken at once of bringing before you my proposals about these things; the more so, because I had been first known to your father here-in, whose virtues I revered. When, however, the Council of Heaven gave him abode in the mansion of the immortals and placed in your power your father’s empire, that same zeal of mine which had remained faithful to his memory found favour also with you. Therefore, along with M. Aurelius and P. Minidius and Cn. Cornelius, I was put in charge of the construction and repair of ballistae and scorpions and other engines of war, and, along with my colleagues, received advancement. After first granting me this surveyorship, you continued it by the recommendation of your sister. There is a conflict of translation, but it must be clearly stated the each translator has rendered the Latin into English in the best possible manner, given the period in which it was translated. In the Gutenberg text it appears that Vitruvius was known to Julius Caesar as an ‘architectes’, a surveyor. If he was employed by a Magistrate as an ‘apparitore’ then the period may well be for one year, renewable, and thus that renewal was brought about by Octavia. The Vit.be translation appears to confirm this point but may have been written with the latest knowledge of the Roman Civil Service in mind, that of ‘apparitores’ and ‘curatores’. Thus Vitruvius could well have been the supervisor, along with his comrades, for war machines, that being one of the many posts to be found in the Roman Civil Service. 3; As, through your kindness, I have been thus placed beyond the reach of poverty, I think it right to address this treatise to you; and I feel the more induced to do so from your having built, and being still engaged in the erection of, many edifices. It is proper to deliver down to posterity, as a memorial, some account of these magnificent works. I have therefore given such definite directions for the conduct of works, that those already executed, as well as those hereafter to be constructed, may be by you well known and understood. In the following pages I have developed all the principles of the art. 3; Owing to this favour I need have no fear of want to the end of my life, and being thus laid under obligation I began to write this work for you, because I saw that you have built and are now building extensively, and that in future also you will take care that our public and private buildings shall be worthy to go down to posterity by the side of your other splendid achievements. I have drawn up definite rules to enable you, by observing them, to have personal knowledge of the quality both of existing buildings and of those which are yet to be constructed. For in the following books I have disclosed all the principles of the art. 3; Since then, I was indebted to you for such benefits that to the end of life I had no fear of poverty, I set about the composition of this work for you. For, I perceived that you have built, and are now building on a large scale. Furthermore, with respect to the future, you have such regard to public and private buildings, that they will correspond to the grandeur of our history, and will be a memorial to future ages. I have furnished a detailed treatise so that by reference to it you might inform yourself about the works already complete or about to be entered upon. In the following books I have expounded a complete system of architecture. It seems rather strange, but Vitruvius knew that Octavian/Augustus was already building extensively and is determined to build more to His own eventual glorification, but he still, in a rather naïve manner, tells the Imperator to read his text and look at what has been built and judge it accordingly. Why is Vitruvius so late with his text? Why is Vitruvius writing in such a manner when he does not name any architectural project he has been involved with previously? All we have is a reference, which may or may not be correct, to the fact Julius Caesar knew him as an ‘architectes’ or just an ‘apparitore’ trained in arts that enabled him to help in the building works. But, Julius Caesar was not a great constructor in terms of civic buildings, so what did Vitruvius do for him? I find the various translations give a variety of meanings such that in the end the man and the persona of Vitruvius is probably exactly as he wished it to be; nobody knows who he really was, what he really was, and if he actually knew the subject fully enough to be able to write the ten books. As you will by now have realised this is an uncompromising but utterly realistic view of the text of Vitruvius. I have read so many texts in which his name is given as if totally proven, his profession is not in doubt, and that he has served in the Roman Army, and that he actually explains everything that is required to be known regarding the architecture preceding, and then of the first century BCE. From the three translations which I use I hope some clarity of vision will be afforded to everybody regarding the text. One of the questions that are rarely addressed by historians regarding the works of Augustus is who were the Architects of his many buildings? It certainly was not Vitruvius, and we can read in his text a bitterness where-by he was never recognized as worthy enough to be called upon. Thus I believe the comment regarding Augustus judging the buildings already built against the ‘so called’ design parameters of Vitruvius’s 10 books indicates a person who knows he has “missed the boat”. This subject rears its ugly head in later books, particularly Book 5. Preface, 1; The education of the Architect, 2; The fundamental principles of Architecture, 3; The site of a city, 4; The city walls, 5; The directions of the streets, with remarks on the winds, 6; The sites for public buildings. There is little to choose between the three translations and the Book I am using with regard to the Winds. One translation states that the hour for investigating the basic compass points is 5 hours before noon, i.e. 7AM, but this I feel is in-correct merely from the length of shadow produced by a gnomon at this hour. I am therefore quoting solely from the Gutenberg text which uses chapter numbers for the preface. Vitruvius commences with a completely non-sensical statement, purely because he has chosen to set out his text in a particular manner. 1: The town being fortified, the next step is the apportionment of house lots within the wall and the laying out of streets and alleys with regard to climatic conditions. This is in fact the methodology for the construction of a Roman Fort by the advance guard such that the main Army can arrive and be accommodated immediately. The ramparts would be hastily dug and in each precisely known location the various sections of the army accommodated. But we are talking about a town, which would not be built from the outside in, but rather established from the main crossing point of the DECUMANUS and KARDES normally by an Apparitore, an Augur, who would by divination determine the site and the cardinal direction of the main crossing point. However the main thrust of his text is reasonable. Why align the streets to the wind directions? To establish those wind directions Vitruvius gives these instructions. 6: In the middle of the city place a marble amussium, laying it true by the level, or else let the spot be made so true by means of rule and level that no amussium is necessary. In the very centre of that spot set up a bronze gnomon or “shadow tracker” (in Greek σκιάθήράζ). At about the fifth hour in the morning, take the end of the shadow cast by the gnomon, mark it with a point. Then, opening your compasses to this point which marks the length of the gnomon’s shadow, describe a circle from the centre. In the afternoon watch the shadow of your gnomon as it lengthens, and when it once more touches the circumference of this circle and the shadow in the afternoon is equal in length to that of the morning, mark it with a point. 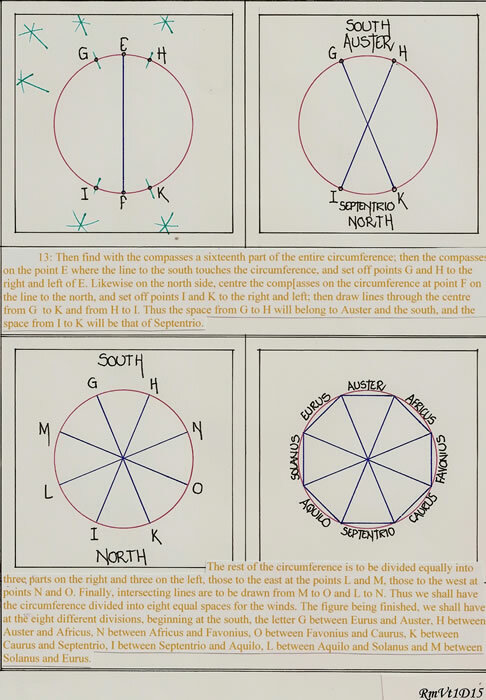 7: From these two points describe with your compasses intersecting arcs, and through their intersection and the centre let a line be drawn to the circumference of the circle to give us the quarters of south and north. 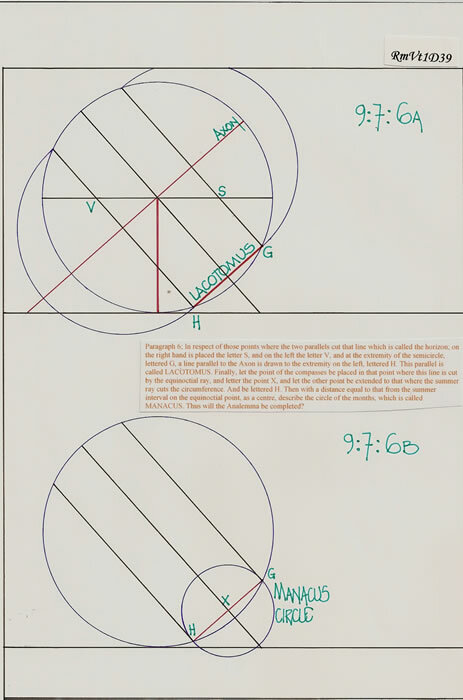 Then, using a sixteenth part of the entire circumference of the circle as a diameter, describe a circle with its centre on the line to the south, at the point where it crosses the circumference, and put points to the right and left on the circumference on the south side, repeating the process on the north side. From the four points thus obtained draw lines intersecting the centre from one side of the circumference to the other. Thus we shall have an eighth part of the circumference set out for AUSTER and another for SEPTENTRIO. The rest of the entire circumference is then to be divided into three equal parts on each side, and thus we have designed a figure equally apportioned among the eight winds. Then let the directions of your streets and alleys be laid down on the lines of division between the quarters of two winds. Basically Vitruvius is describing the use of an “amussium” to carry out this task, which is a square or rectangular board or marble slab on which the diagram is drawn.. It would be quite differently described if it was an exercise on the earth surface he alludes to. Compasses would be impossible to use and strings/cords to scribe circles utilised. The etymology of the word amussium is from Amussitatus or “nicely adjusted”; Amussis, Amussum, “a carpenters rule”, and ad amussim, “exactly”. There is a surprising insertion into the text, but obviously it is intended to illustrate just how well read was Vitruvius. 9: Those who know names for very many winds will perhaps be surprised at our setting forth that there are only eight. Remembering, however, that Eratosthenes of Cyrene, employing mathematical theories and geometrical methods, discovered from the course of the sun, the shadows cast by an equinoctial gnomon, and the inclination of the heaven that the circumference of the earth is 252,000 stadia, that is, 31,500,000 paces, and observing that an eighth part of this, occupied by a wind is 3,937,500 paces, they should not be surprised to find that a single wind, ranging over so wide a field, is subject to shifts this way and that, leading to a variety of breezes. Vitruvius has decided that there shall be eight winds, major winds, and everything else shall be classed as a squall or local breeze, but he names 16 in paragraph 10 as the diagrams indicate. And, having stated that he will be concise in his text, decides he has treated the topic with brevity and re-commences. 12: If he was wrong, the only result will be that the individual winds may blow, not with the scope expected from his measurement, but with powers either more or less widely extended. For the readier understanding of these topics, since I have treated them with brevity, it has seemed best to me to give two figures, or as the Greeks say, σχήμάτά, at the end of this book: one designed to show the precise quarters from which the winds arise; the other, how by turning the directions of the rows of houses and the streets away from their full force, we may avoid unhealthy blasts. Let A be the centre of a plane surface, and B the point to which the shadow of the gnomon reaches in the morning. Taking A as the centre, open the compasses to the point B, which marks the shadow, describe a circle. 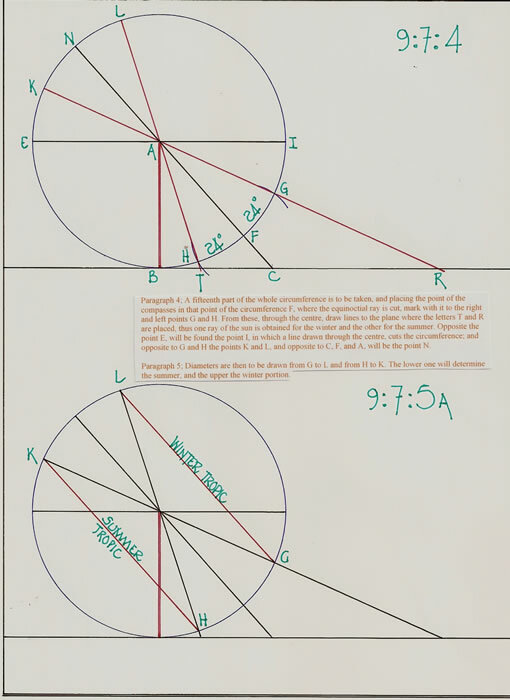 Put the gnomon back where it was before and wait for the shadow to lessen and grow again until in the afternoon it is equal to its length in the morning, touching the circumference at the point C. Then from points B and C describe with the compasses two arcs intersecting at D. Next draw a line from the point of intersection D through the centre of the circle to the circumference and call it E F. This line will show where the south and north lie. 13: Then find with the compasses a sixteenth part of the entire circumference; then the compasses on the point E where the line to the south touches the circumference, and set off points G and H to the right and left of E. Likewise on the north side, centre the comp[asses on the circumference at point F on the line to the north, and set off points I and K to the right and left; then draw lines through the centre from G to K and from H to I. Thus the space from G to H will belong to Auster and the south, and the space from I to K will be that of Septentrio. The rest of the circumference is to be divided equally into three parts on the right and three on the left, those to the east at the points L and M, those to the west at points N and O. Finally, intersecting lines are to be drawn from M to O and L to N. Thus we shall have the circumference divided into eight equal spaces for the winds. 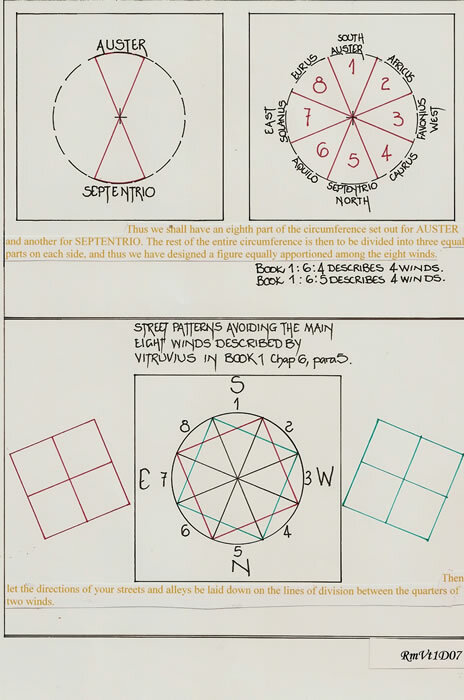 The figure being finished, we shall have at the eight different divisions, beginning at the south, the letter G between Eurus and Auster, H between Auster and Africus, N between Africus and Favonius, O between Favonius and Caurus, K between Caurus and Septentrio, I between Septentrio and Aquilo, L between Aquilo and Solanus and M between Solanus and Eurus. This done apply a gnomon to these eight divisions and thus fix the directions of the different alleys. Other than the fact that Vitruvius has introduced letters for the circumferential points, this text differs little from paragraphs 6 and 7. 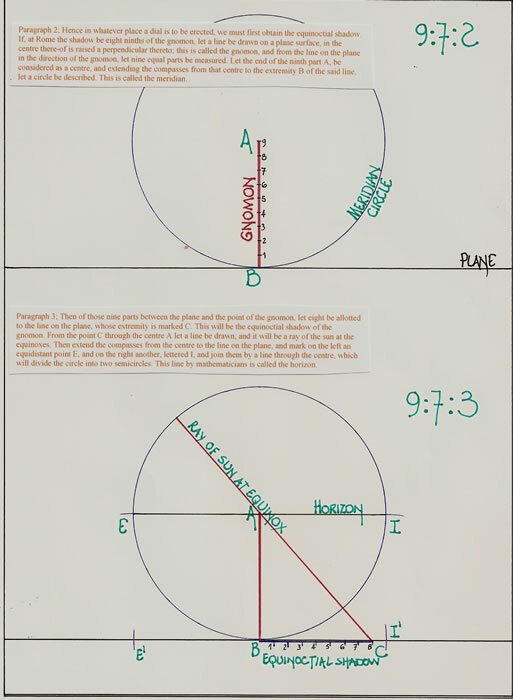 In fact it is slightly harder to understand as certain instructions such as remove the gnomon to draw the circles and then replace it and the methodology for finding the sixteenth part of a circle are omitted. It could have been expressed in much simpler terms, and would surely have already been set on a parchment such that the orientation of north/south was all that was required to be found. Thus simply by drawing a circle with 16 divisions marked, and the octagon already inscribed with wind names attached, this tool was available for ready use. Topographical interventions would have precluded this method ever being used in practise and it therefore appears to be a good idea, a theoretical ideal which could not actually be used in town planning. There is however one translation anomaly to discuss, that of the last sentence in paragraph 13. In the Gutenberg and Vit.be translations the gnomon is used to align the streets to the counter-wind direction. But in the Lacus Curtius translation the implement used is a Bevel Gauge (D17). A gnomon will not produce an angular reading of the desired street directions only being a pointer of that direction. Therefore I have chosen to accept that a Bevel Gauge would be the preferred measuring tool and could thus be used to Gauge all of the angles required instead of the laborious methodology of the compasses. It should be borne in mind that any tool which relies upon the sun to determine information must be located to the cardinal points of the compass. 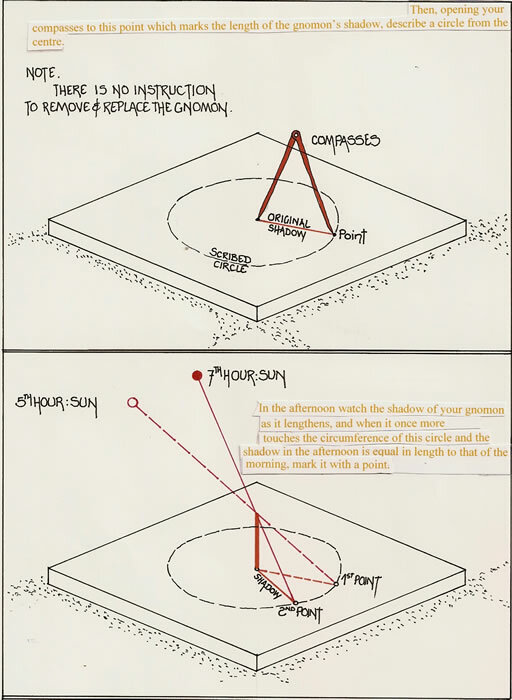 The sun at noon in the northern hemisphere always produces a shadow which is north/south, but it is necessary to know noon precisely, and therefore the shadow is always tracked from before to after noon to obtain the required accuracy. At an Equinox the sun always rises due East and sets due West, but again that depends upon the landscape permitting the correct view. A flat plain would be perfect. Therefore a portable sundial or scaphe, if they are to be of any use, must be aligned each time they are to be used. Thus we read in the text of Pliny the Elder the necessity for each Polis to have a gnomon permanently erected to provide accurate data. Therefore, if Vitruvius really wanted to indicate a design theory for new Poleis, it would have been more appropriate for him to have suggested that at the inception of the Polis a gnomon should be permanently erected with the cardinal points already located on the “amussium”. e) internal layout for orientation of Temples, Forum etc. Therefore it is safe to opine that the construction of the city walls would follow the original foundation of the town when sufficient persons were inhabitants and thus available to pay for the protection. The order of the paragraphs within the text is correct and not a scribal mistake, as Vitruvius also indicates that which he has previously written about. Therefore it is also possible to opine that the procedural order he writes about is completely unrealistic and could not be followed. The design of a new town would incorporate all of his paragraphs in one overall scheme, but in a revised order. 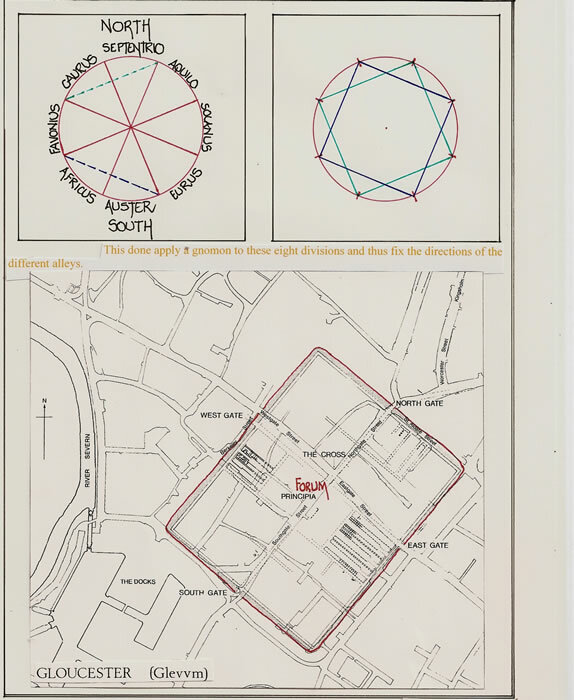 The orientation of streets, allocating public spaces and perhaps the city wall position would thus be pre-determined in order that chaos did not ensue and the new town functioned properly. The direction of the winds, to avoid “wind tunnels”, is a wise precaution. But, if a town is surrounded by high walls, it is more likely that the larger open spaces within the town would cause the “Wind Tunnels” or “ghastly corners” where the wind accelerates, rather than the street commencing inside the walls and facing a wind direction. 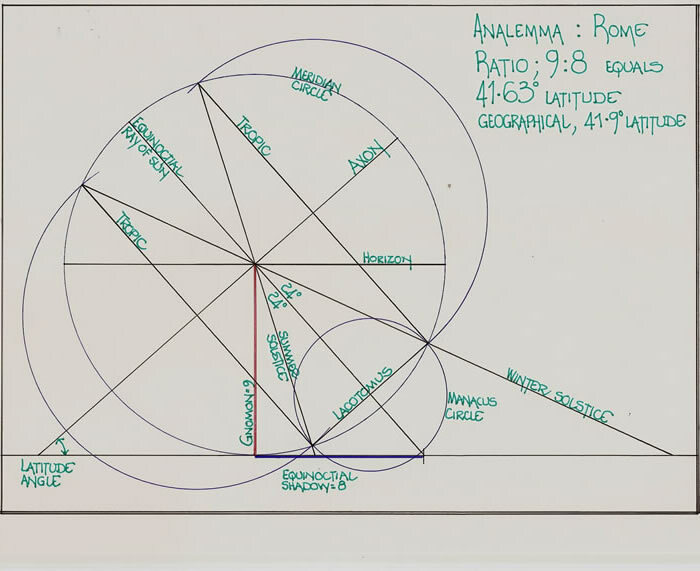 However, the accuracy of this methodology is not required given that there are 8 winds and each has a 45 degree quadrant from which to blow and Vitruvius clearly knows that a wind can blow from any portion of the quadrant, thus making the orientation negligible. The design requirement may also be questioned when we bear in mind the seasonal nature of some winds, and the fact that in many instances they are a welcome relief to the unrelenting sunshine and heat. Introduction, 1; The origin of the dwelling house, 2; on the primordial substance according to the physicists, 3; Brick, 4; sand, 5; Lime, 6; Pozzolana, 7; Stone, 8; Methods of building walls, 9; Timber, 10; Highland and lowland Fir. (part); Alexander ordered Dinocrates to build a city whose name should be Alexandria. Dinocrates obtained this honour through his comely person and dignified deportment. But to me, Emperor, nature hath denied an ample stature; my face is wrinkled with age, and sickness has impaired my constitution. Deprived of these natural accomplishments, I hope, however, to gain some commendation through the aid of my scientific acquirements, and the precepts I shall deliver. The introduction to Book 2 comprises 5 paragraphs of text. The first 4 are the tale of Dinocrates an architect at the time of Alexander the Great, and how comely a person he was. It is also a blatant example of jealousy on the part of Vitruvius as he seeks the sympathy of the Emperor. The subject, Building Materials, in our age is a major component in the training of persons employed in the building industry. Knowledge of their inter-connectivity, reaction to each other and suitability for a given project is paramount. Thus from Chapter 3 onwards we should read an exposition of materials and their constituent parts that should include all elements of construction. In this chapter Vitruvius states the type of clay to be used as, ‘whitish clay’ or ‘red earth’ and even ‘coarse sand’. The bricks are to be naturally dried, which should take at least two years. 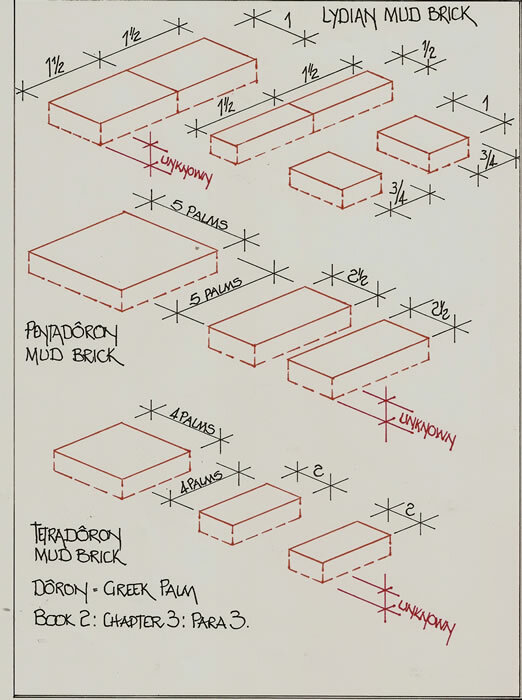 His comments regarding imperfectly dried bricks and the problems to be encountered are well placed, as is the methodology to be followed in bonding the courses. But then when he describes the sizes of the bricks we are not old the most important fact. What is the thickness of each brick? This thickness is so very important, as it firstly provides the strength to avoid distortions in the large bricks of 1 1/2 x 1 feet surface area, and it also controls the height of each floor level of the construction. 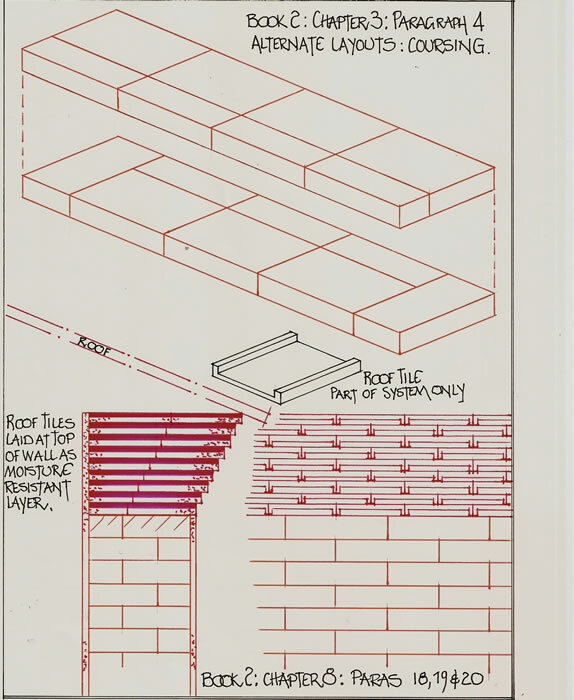 He also fails to comment on the fact that the bricks must be stagger bonded to avoid any vertical joints, just as he describes half bricks to allow cross bonding in the wall construction. The sand for concrete masonry is equally a good descriptive chapter, aiding the builder with the knowledge to recognize ‘good sand’ from that containing detritus. This chapter does not actually discuss the material itself, its methodology for ‘cooking down’ or ‘slaking’. However in Book 7, chapter 2 entitled “slaking of lime for stucco” we are informed how to carry out this operation on “clods of Lime”. Perhaps it would have been better placed here. Thus Vitruvius is relying upon a group of people- unmentioned- who produce the usable material, and hopes that they are all competent, and that all 10 books will be read before commencing any work envisaged. The mixtures discussed are as follows, a) 3 parts excavated sand to 1 part lime, which is a very basic mix used today, b) 2 parts river sand to 1 part lime, as the river sand is much finer grains, and, c) river sand, lime and crushed potsherds is a better mortar. Within chapter 4, Sand, Vitruvius hints but does not fully explain the reasoning behind the use of sands. Coarse sand -that crackles- is better than fine sand, the type that a moderate breeze can lift from a beach in a fine spray. Thus the finer the sand the more lime is required to bind it all together. But adding potsherds to fine sand and lime will bulk the material and provide for a thicker bed joint. Very simple points, but Vitruvius does not state them, and they require to be made. Perhaps the most interesting point made by Vitruvius in paragraphs 5 and 6 of Chapter 6, is the discussion regarding the variety of terrains, soils and rocks that are spread throughout the countryside of Italy, and would be a good chapter to have been written, ‘The Geology of Italy’, but Pliny covers the subject in his ‘Natural History’. The foregoing is an excellent construction technique; basically protect the top of the wall from water seepage. But can we really believe that Vitruvius has decided that there is no method for assessing clay terracotta roof tiles prior to their being installed and failing insitu. And, just where these second hand roof tiles are to come from to protect the top of these new walls is not explained. But, more importantly Vitruvius has stated that the ROOF is of prime importance. However he does not discuss the terracotta for the roof tiles; he does not discuss what form the tiles take; he does not discuss the construction of a roof to ensure water-tightness is achieved, and he does not mention the necessity for any special tiles for ridges, hips and valleys. The whole subject of the Roof for any building at this point in his text is completely ignored; WHY? The European Larch, Larix Europaea, is native to the Italian Alps, but not the Pyrenees. It grows straight and rapidly to c100 feet high, and is an extremely durable wood, however boards made from it are apt to warp, and it shrinks readily. The liability to warping can be somewhat obviated by barking the trees whilst they are growing in the spring and then cutting them in the following autumn or before the next spring. Larch weighs from 34 to 37 lbs per cubic foot; it will polish well and withstand wear. Thus we can evaluate its journey from northern Italy to Fano, and its possible usage there. Introduction, 1; On symmetry, in temples and in the human body, 2; Classification of temples, 3; The proportions of intercolumniations and of columns, 4; The foundations and sub-structures of temples, 5; Proportions of the base, capitals and entablature in the Ionic order. The introduction to Book 3 comprises but four paragraphs and yet again Vitruvius shows his ire at having been overlooked previously and his aloofness because of his supposed superiority. 3 (part); Now if as Socrates wished our feelings, opinions, and knowledge gained by study had been manifest and clear to see, popularity and adulation would have no influence, but men who had reached the height of knowledge by means of correct and definite courses of study, would be given commissions without ant effort on their part. However, since such things are not plain and apparent to view, as we think they should have been, and since I observe that the uneducated rather than the educated are in higher favour, thinking it beneath me to engage with the uneducated in the struggle for honour, I prefer to show the excellence of our department of knowledge by the publication of this treatise. 2; which nature has also so fashioned, that in the face, from the chin to the top of the forehead, or to the roots of the hair, is a tenth part of the height of the whole body. The open hand from the wrist to the tip of the middle finger is just the same. From the chin to the crown of the head is an eighth part of the whole height and from the nape of the neck to the crown of the head the same. From the upper part of the breast to the roots of the hair a sixth; to the crown of the head a fourth. A third part of the height of the face is equal to that from the chin to the under side of the nostrils, and thence to the middle of the eyebrows the same; from the last to the roots of the hair, where the forehead ends, the remaining third part. The length of the foot is a sixth part of the height of the body. The fore-arm, a fourth part. The width of the breast, a fourth part. Similarly have other members their due proportions, by attention to which ancient Painters and Sculptors obtained so much reputation. 3; Just so the parts of Temples should correspond with each other, and with the whole. The navel is naturally placed in the centre of the human body, and, if in a man lying with his face upward, and his hands and feet extended, from his navel as the centre, a circle be described, it will touch his fingers and toes. It is not alone by a circle, that the human body is thus circumscribed, as may be seen by placing it within a square. For measuring from the feet to the crown of the head, and then across the arms fully extended, we find the latter measure equal to the former; so that lines at right angles to each other, enclosing the figure, will form a square. The human form has been studied by many civilisations, particularly the Egyptians and Greeks. In recent times we have developed the science of anthropometrics to facilitate the better design of implements used in everyday life. Thus the perfection sought by the Greek sculptors in their portrayal of mainly the male human body will be hard to determine in today’s society. It is therefore perhaps invidious/courting criticism to attempt an explanation of this section of the text by Vitruvius. 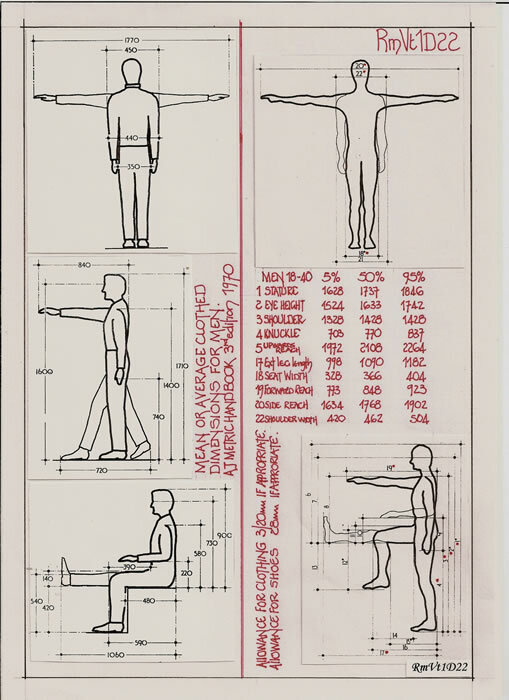 He discusses the proportions of the human figure and applies the symmetry and proportion to buildings. The iconic diagram (which is taken as an illustration of this text) is that of ‘Vitruvian Man’ by Leonardo Da Vinci, created around 1487CE. There is however a subtle difference between that written by Vitruvius and that drawn by Leonardo. 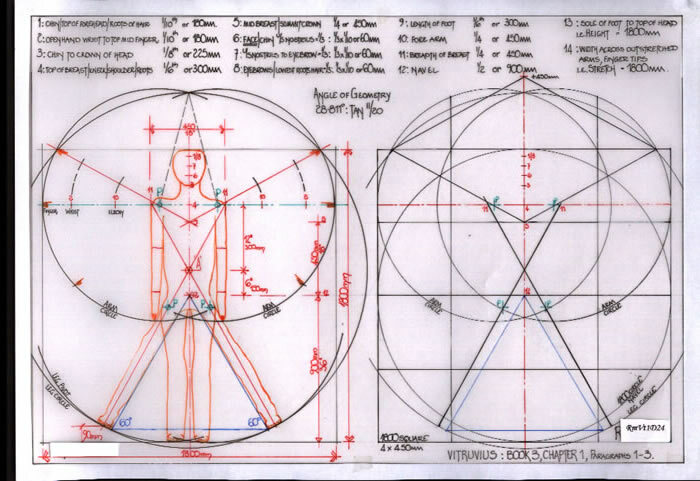 Vitruvius states,” the navel is naturally placed in the centre of the human body—— navel as centre, a circle is scribed.” He then discusses a separate diagram were-in the human body forms a square. Thus Vitruvius sees these as two separate diagrams, which he possibly knew would not coalesce as one. 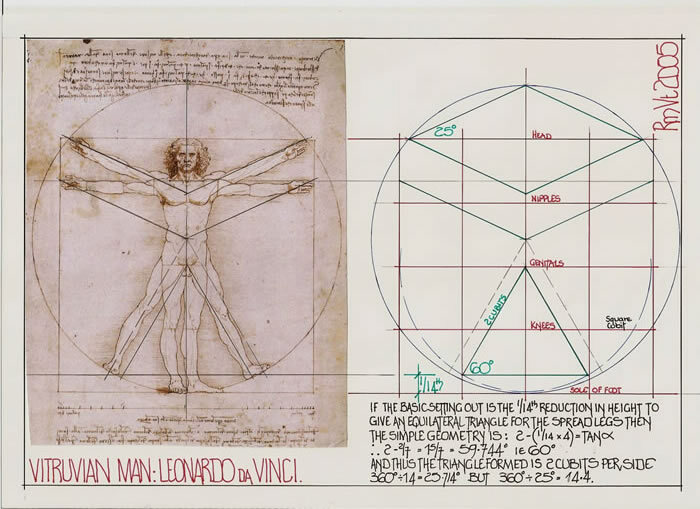 Leonardo cleverly incorporates both diagrams into that most iconic sketch, but he improves the thesis noting that by the spreading of the legs, the stature of a man is reduced by 1/14th part of the height and he therefore uses two centres to coalesce the two diagrams into one. 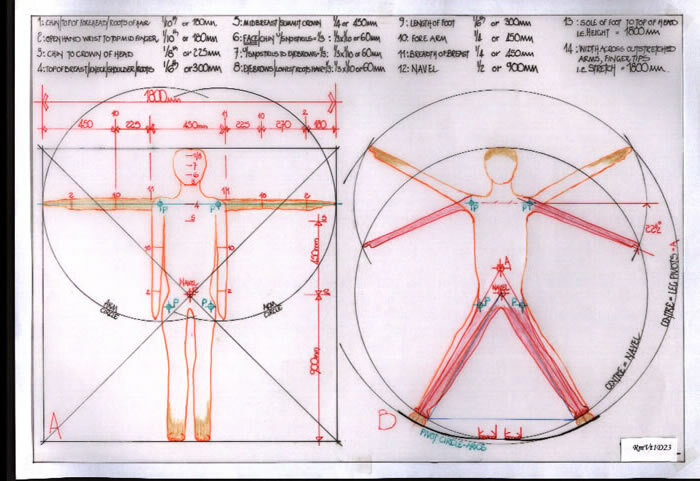 I have included a sketch of the anthropometric data applicable to modern man and included the two diagrams as drawn by Vitruvius plus a comparative diagram to that of Leonardo. Perhaps the most interesting section of this text, quite obscured by Leonardo’s diagram is found in paragraphs 7 and 8 where-in Vitruvius discusses the sub-division of a man’s height and the measurements thereby obtained; the Cubit, Palm, Digit etc. These are the supposed basis of all measures, and in my texts Ms2 and Ms3, which deal with ancient metrology you will find reference to all that has been written. This part of the text by Vitruvius has created an enormous following since Leonardo Da Vinci drew his iconic diagram, but the geometry behind it all has been omitted. Thus I have created a second text, RmVt2 which deals solely with this subject. Here-in Vitruvius endeavours to show his knowledge, particularly of Plato’s work. He balances Plato’s perfect 10 against that of others (un-named) who say that 6 is that number. He fully justifies that statement as to why 6 should be so lauded and concurs with the theory that the human body is the measure of all things. This chapter discusses the foundation works required to support the above ground work. 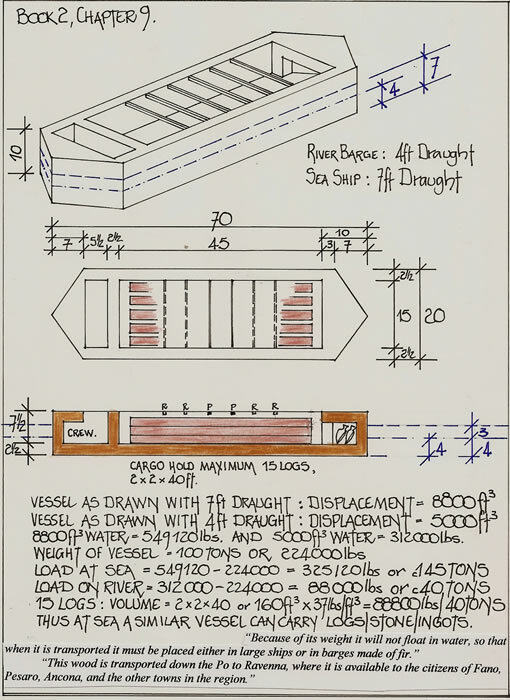 However, for an “architectes” his comment, “ the foundations of these should be sunk down to solid ground and in solid ground if it can be found, as much as seems reasonable for the size of the work, and the whole site should be built up with rubble work as solidly as possible” is perhaps unhelpful. “Above ground level walls should be constructed underneath the columns, half again as thick as the columns are to be, so that the lower parts of the building will be more stable than the upper parts”. Thus he realises the need for stability at this level, but in using the term “walls” and implying a square or rectangular foundation which should be joined to its neighbour by an arch or rammed fill he does not appreciate the column spacing above may vary considerably and hence a stable method would be a continuous wall in many instances. 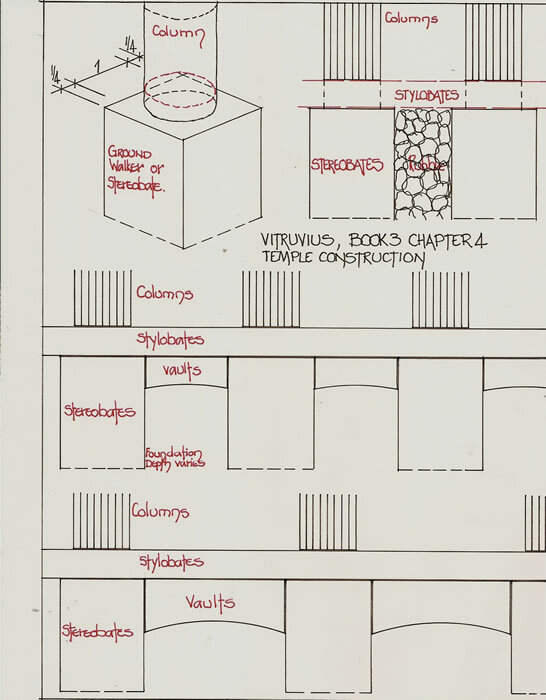 Vitruvius names temple types within his text; In Antis Temple, in the sanctuary of the three Fortunae, close to the Porta Collina; Prostyle temple, Jupiter and Faunus on Tiber Island; Peripteral temple, Jupiter stator in the Porticus Metelli by Hermodorus and the Temple of Honos and Battlecourage, made by Mucius next to the Mariana; The Pseudodipteros Temple example is that of the Temple of Diana in Magnesia by Hermogenes and the Temple of Apollo at Alabanda by Menesthenes; The Dipteros Temple is given as the Doric Temple of Quirinus and the Ionic Temple of Diana at Ephesus set up by Chersiphon. Finally the Hypaethral Temple, of which there is no example in Rome, is given as the Temple of Olympian Jupiter in Athens. 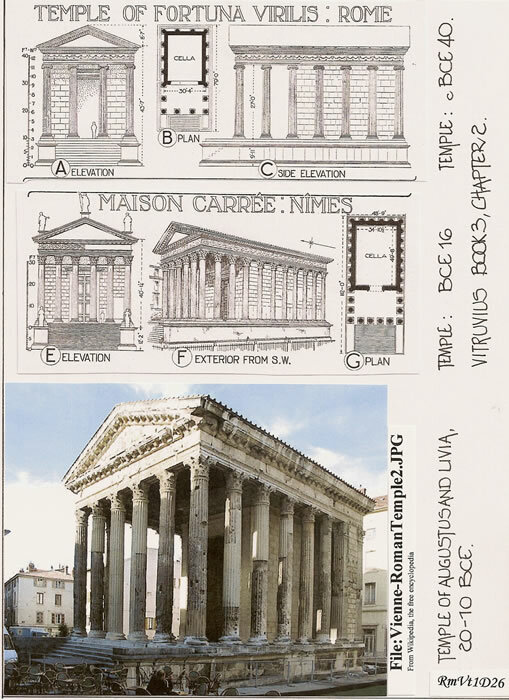 Three temples which may have actually been seen by Vitruvius are illustrated on diagram RmVt1D26. It is in chapter 3, “The Species of Temples” that we read of the actual column spacing, the intercolumnar space or intercolumniations, which allows us to assess the foundations. Vitruvius lists 5 species, Pycnostyle, Systyle, Diastyle, Araeostyle and Eustyle. EUSTYLE; Column placement is correct i.e. between 2 and 3. Thus with a column base wall 1 ½ times the column in width, then, with the Pycnostyle foundations the intervening space will equal the column width and get progressively larger as the spacing increases. Thus in all probability the first has the rubble fill in the inter-spaces and the second and third require the support vaulting to stabilise the actual bases, the ‘stereobates’. Diagram RmVt1D27 has examples there-on. Introduction, 1; The origins of the three orders and the proportions of the Corinthian capital, 2; The ornaments of the orders, 3; Proportions of Doric temples, 4; The cella and pronaos, 5; How the temple should face, 6; The doorways of temples, 7; Tuscan temples, 8; Circular temples and other varieties, 9; Altars. I have observed, Emperor that many in their treatises and volumes of commentaries on architecture have not presented the subject with well-ordered completeness, but have merely made a beginning and left, as it were, only desultory fragments. I have therefore thought that it would be a worthy and very useful thing to reduce the whole of this great art to a complete and orderly form of presentation, and then in different books lay down and explain the required characteristics of different departments. This is the first part of a very short single paragraph introduction to Book 4. Where-as the text within the book certainly assists us in understanding the form of the various temples, perhaps this introduction should have been part of Book 1 preface, and not 3 books later. This text has also been analysed by many writers commencing in the 16th century until now. Further text is therefore probably unnecessary. 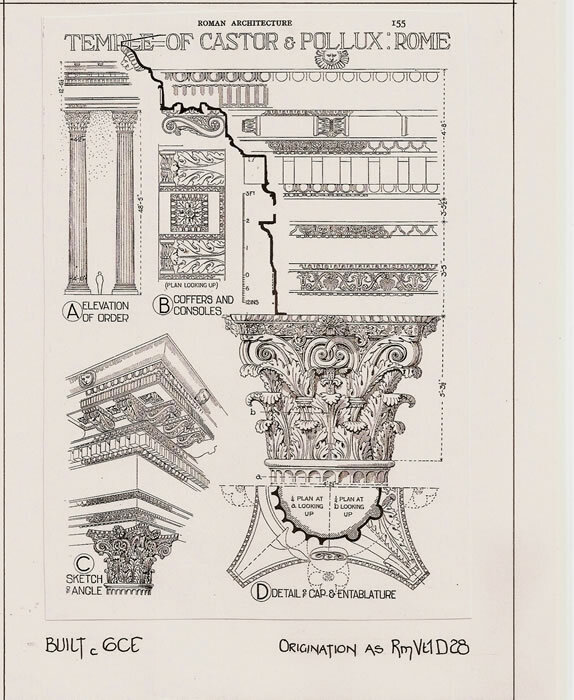 I have added two diagrams which hopefully will aid the reader to understand the so called “orders of Architecture” and the complexity of the Corinthian Column capital. There are 6 paragraphs in this chapter in which Vitruvius considers he is speaking about the ornaments of the orders. In fact it is a constructional text informing us how the use of beams and other roof supporting members are to be hidden by ornamentation. It is the only text which actually discusses a part the ROOF of a building, and then only in general terms. Because this section of the text impinges completely upon the description given in Book 5 of the Basilica at Fano, I have incorporated the analysis there. Thus text RmVt3 should be studied. Introduction, 1; The Forum and Basilica, 2; The Treasury, Prison and Senate House, 3; The theatre; its site, foundations and acoustics, 4; Harmonics, 5; Sounding vessels in the theatre, 6; Greek theatres, 7; Acoustics of the site of a theatre, 8; Colonnades and walks, 9; Baths, 10; The Palaestra, 11; Harbours, breakwaters and shipyards. BOOK 5; THIS BOOK IS THE SUBJECT OF A SEPARATE TEXT REFERENCE RmVt3. Introduction, 1; On climate as determining the style of the house, 2; Symmetry and modifications in it to suit the site, 3; Proportions of the principle rooms, 4; The proper exposures of the different rooms, 5; How the rooms should be suited to the station of the owner, 6; The farmhouse, 7; The Greek house, 8; On foundations and substructures. Paragraph 4; I therefore feel myself under infinite obligations and am grateful to my parents, who adopting the practice of the Athenians, took care that I should be taught an art, and one of such a nature that it cannot be practised without learning and a general knowledge of the sciences. Since, then, by my parents care, and by the instruction of masters, I had the means afforded me of acquiring knowledge, and was naturally delighted with literary and philosophical subjects, I laid up those stores in my mind, from the use of which I enjoy the advantage of wanting no more, and the value of riches consists in having nothing to wish for. But some thinking, perhaps, lightly of these things, suppose those only are wise who have plenty of money. Hence, may, aiming at that end alone, have, by the aid of their assurance, acquired notoriety from their riches? Paragraph 5; But I, Caesar, have not sought to amass wealth by the practice of my art, having been rather contented with a small fortune and reputation, than desirous of abundance accompanied by a want of reputation. It is true that I have acquired but little; yet I still hope, by this publication, to become known to posterity. Neither is it wonderful that I am not known but to a few. Other architects canvass, and go about soliciting employment, but my preceptors instilled into me a sense of the propriety of being requested, and not of requesting, to be entrusted, inasmuch as the ingenuous man will blush and feel shame in asking a favour; for the givers of a favour and not the receivers, are courted. What must be suspect who is solicited by another to be entrusted with the expenditure of his money, but that it is done for the sake of gain and emolument? Paragraphs 6 and 7 continue in a similar vein. It is in this section of the text that the unusual occurs. Vitruvius praises his parents but fails to name them. It is normal practise in Roman times to glorify your parents and the family name for posterity. That Vitruvius does not opens the speculation door. What is he in fact hiding? He states that he was delighted with literary and philosophical subjects, but is thoroughly criticised by scholars for a lack of rhetoric and a basic writing style which dwells on the minutiae whilst ignoring major items as has been shown. The translation of Paragraph 5, in Rowland/Howe reads quite differently. The first two sentences are as follows; “But I, Caesar, never devoted my efforts to making money by my art, but rather thought that I should pursue modest means and a good reputation – not wealth and infamy. Thus up to this point little fame has followed upon my work, yet I hope that once these volumes are published I will be known to future generations”. This appears to be a plea from a person who realising he has not succeeded in life, as he does not mention another single building, or even hint at a second or third building he had been responsible for, and is burning with the desire to be recognised. The first three paragraphs of the preface bear no relation to the text which follows except to provide a basis for the comments made regarding the Athenian methodology of parental teachings. Chapter 1 teaches so very little except that it contains common-sense, no doubt practised by all persons building a house, and building to suit the climatic conditions. “Hence under a northern sky buildings should be entirely roofed over and be as enclosed as possible, oriented toward the warmer regions but not open to them”. But again, the ROOF is basically avoided in all of the discussions, although in Chapter 3, Interiors, there are obtuse comments. “Tuscan interiors are those in which the transverse beams of the atrium have hanging joists (between them) and gutters running inward from the corners of the walls to the intersections of the beams, with rafters sloping downward into a central compluvium to collect rainwater. Thus the “compluvium” system, “with-rainwater” may be taken as accepting the water and using it whilst the “displuviate” system is anti-water and requires its disposal to ground drains or similar. I cannot but wonder if Vitruvius was actually thinking about the text and his desire to aid persons, particularly Augustus Caesar in good building practice, when he wrote those words, having not once given advice on the construction of the most vital part of a building after the foundations, its roof. Preface; 1) floors, 2) Slaking Lime for Stucco, 3) Vaultings and Stucco, 4) Stucco/damp places/ Décor of Dining Rooms, 5) The decadence of Fresco painting, 6) Mable for use in Stucco, 7) Natural Colours, 8) Cinnabar and Quicksilver, 9) Cinnabar, 10) Artificial colours, 11) Blue and Burnt Ochre, 12) White lead, Verdigris, natural Sandarach, 13) Purple, 14) subs for Purple, Yellow ochre, Malachite Green, Indigo. In paragraph 10, Vitruvius clearly states he is using the works of a large number of authors to provide the data for his own text. The previous 9 paragraphs are merely a prelude explaining that a large library is essential. Paragraph 10, I, therefore, O Caesar, do not publish this work, merely prefixing my name to a treatise which of right belongs to others, nor think of acquiring reputation by finding fault with the works of any one. On the contrary, I own myself under the highest obligations to all those authors, who by their great ingenuity have at various times on difficult subjects, furnished us with copious materials; from which, as from a fountain, converting them to our own use, we are enabled to write more fully and expediently, and, trusting to whom we are prepared to strike out something new. Paragraph 10, But for my part, Caesar, I am not bringing forward the present treatise after changing the titles of other men’s books and inserting my own name, nor has it been my plan to win approbation by finding fault with the ideas of another. On the contrary, I express unlimited thanks to all the authors that have in the past, by compiling from antiquity remarkable instances of the skill shown by genius, provided us with abundant material of different kinds. Drawing from them as it were water from springs, and converting them to our own purposes, we find our powers of writing rendered more fluent and easy, and, relying upon such authorities, we venture to produce new systems of instruction. It is thus that we can understand why Vitruvius does not include the many facts necessary to enable his prime purpose within his text to be completed. He is basically using the text of many previous authors and in effect compiling an encyclopaedia of data from those author’s works. Rowland/Howe in their commentary upon this section have compiled a complete list of the authors and their genre. However, it must be acknowledged that the constructional data here-in is by far the best explained and thus it would point to Vitruvius having been actively engaged in this work. If the other sections of his text were so fully explained and accurate in their content, no doubt Vitruvius may have been known. Preface, 1) How to find water, 2) Rainwater, 3) Properties of waters, 4) Tests for good water, 5) Levelling and levelling instruments, 6) Aqueducts, wells and cisterns. The necessity for water and its life giving quality are discussed. Within the first five chapters there is a discourse upon water and the natural ecology which Vitruvius thinks affects water. He discusses rivers as far away as the Ganges and the poisoned water of Terracina, whilst showing his apparent erudition by quoting at length epigrams from various cultures regarding water. It is not until the last chapter that we gain constructional details concerning the supply of water. The chapter commences with, “there are three types of watercourses, in open canals with masonry channels, or lead pipes, or terracotta tubing.” However, paragraph 4 gives the details of lead piping, and its usage. Paragraph 4;”If waters are going to be conducted in systems of lead pipes, first a castellum aquae should be constructed at the source, and then the diameter of the pipes should be fixed on the basis of the water supply. The piping system should be laid down to extend from this castellum to the castellum within the city walls. Pipes should be cast so that they are no less than 10 feet long. If they are going to be hundred digit pipes, individually they should weigh 1200 pounds; if 50 digit pipes, 600 pounds; 40 digit pipes should weigh 480 pounds; 30 digit pipes, 360 pounds; 20 digit pipes, 240 pounds; 15 digit pipes, 180 pounds; 10 digit pipes, 120 pounds; 8 digit pipes, 100 pounds; 5 digit pipes, 60 pounds. The names of the sizes of lead pipes are taken from the sizes of their plate before they have been bent around into tubes. Thus the panels that are 50 digits wide, when made into pipe, will be called a 50 digit pipe, and so on for the rest”. It is patently obvious that the pipe sizing is no more than a mathematical progression of weight and thus each pipe when formed will have the same thickness of walling. That also is patently nonsensical, as a small diameter pipe does not require the same as the largest pipe to withstand the water load and pressure there-in. 100 digits x 160 digits (10 pedes) = 1200 Pondo (pounds). Each “Pondo” is 11 ½ ounces and thus the total weight is 862.5 Lbs. A cubic Digit is 0.72794 cubed which equals 0.385733 inches cubed and thus there are 373.33 cubic digits in 144 cubic inches, and therefore a cubic digit weighs 945.28 ounces divided by 373.33 which means it weighs just 2.532 ounces. The thickness is therefore obtained by dividing the square digit = 0.8625 ounces by 2.532 and thus it is 0.34 or 1/3rd of a digit thick. This is the equivalent of 6mm. Does a pipe with a circumference of 10, 8 or 5 digits require to be 6mm wall thickness; NO! We are given the circumference of each pipe ranging from 100 to 5 digits and thus it is a simple mathematical exercise to establish the actual pipe diameter which is used. It is possible that both ratios for PI were used and thus the following table sets out the complete picture. We can then establish that the basic casting panel was 100 x 160 digits which can be subdivided to produce a variety of pipe sizes from the single pouring of 1200 Pondo of lead. It will be seen from the above table that the pipe size corresponds to a known diameter and thus a timber former can be lathe turned to enable the flat plate of lead to be bent around the log and a perfect tube provided. This of course means that the joint method for the tube was the simplest possible, a long soldered horizontal joint at the top of the formed tube. This is somewhat contrary to the example often quoted and illustrated from the City of Bath where the pipe is overlapped and bent to form a joint which grips the lead before it is soldered. 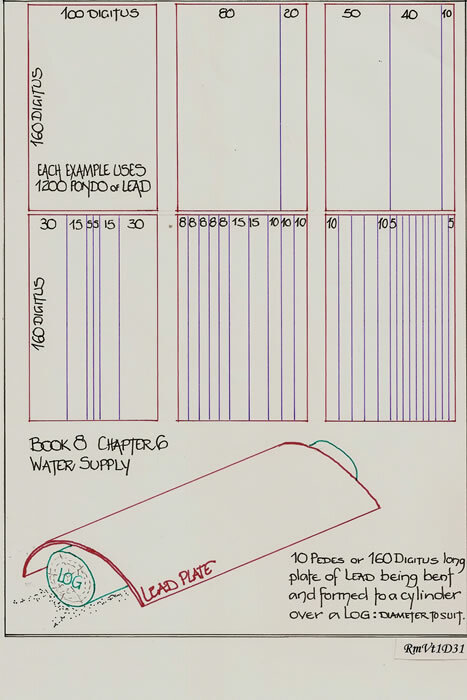 The question that must be asked is, “would the widths of lead sheet be so correct that a turned log could be used as a former if an amount had to be removed to allow for the joint?” This is particularly pertinent when the smaller pipe diameters are considered when such a joint would reduce them considerably. In this day we would use a “wiping lead” to form the joint. That is lead which is only just fluid and will not burn away the edges of the tube to be formed. The Romans were experts in this work and would surely have followed best practice with a soldered straight joint. “25; At a later period, an ajutage called a quinaria came into use in the city, to the exclusion of the former measures; this had its origin neither in the inch, nor in either of the two digit measures named, but was introduced, as some say, by Agrippa, according to others by plumbers acting under the direction of the architect Vitruvius; it was so called, according to those who ascribe it to Agrippa, because five small ajutages or punctures of the old type, according to which water was formerly dealt out, when the supply was as yet insignificant, were united into one pipe; according to those who ascribe it to Vitruvius and the plumbers, it took its name from the circumstance that a flat sheet of lead 5 digits wide, made up into a round pipe will form this ajutage. But, this is indefinite; because the plate when made up into a round pipe will be extended on the exterior surface and contracted on the interior surface. The most probable explanation is, that the quinaria ( or 5 pipe) received its name from the fact of its being five fourths (of a digit) in diameter, a method of designation which still applies in the case of the other ajutages up to the 20 pipe, each size being larger than its predecessor by a quarter, for example, a 6 pipe is 6 quarters in diameter; a 7 pipe, seven quarters, and so on up to a 20 pipe. From this text we can establish that Vitruvius possibly codified what was standard practice amongst the plumbers of Rome, but that Frontinus did not read the text of Vitruvius or the queries would not have arisen. It is curious that Frontinus should query the rolling of a lead sheet into a circle and worry about the change of circumference internally and externally. Lead as he surely knew is very malleable, capable of being hammered, stretched etc to form a proper circle. If a former was used as the Vitruvian data implies, then this would have been common practice so that the joint was minimised. Thus we can assess the text of Vitruvius as a “perfect” method of producing Lead pipes of known diameters and thus flow rates, but we can also opine that in continuing the mathematical progression he lost sight of the practicalities and produced Lead pipes with wall thickness totally disproportionate to their diameter. We may therefore ask if he knew the subject or was copying the work of others. It is worth noting that Frontinus in his text, Book 1, paragraphs 9, 10 and 11 discusses the work carried out by Marcus Agrippa when Aedile, who ensured two new water supplies were sourced and directed to Rome. Frontinus also criticises Augustus Caesar whom he calls a most sagacious sovereign for bringing the water from the Alsietinian Lake on the Claudian way, stating that it is positively unwholesome and not used for potable water. In fact it could only be used for irrigation purposes. 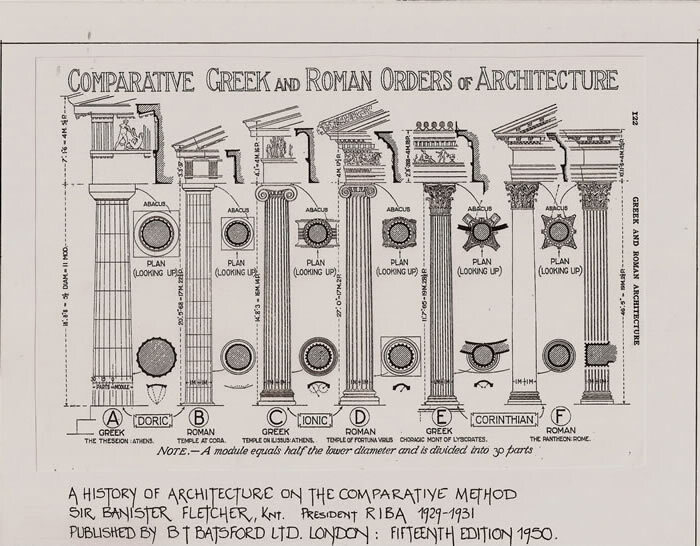 Could this be the project Vitruvius was engaged with to learn from plumbers the pipe sizes, and was it thus a project not bringing plaudits as he desired? Introduction, 1) Zodiac and Planets, 2) Phases of the Moon, 3) Course of the sun through zodiac, 4) Northern constellations, 5) Southern constellations, 6) Astrology and Weather prognostics, 7) The Analemma and its applications, 8) Sundials and water clocks. Paragraphs 1 and 2 names many ancient writers and the debt owed to them. But paragraph 3 continuing the theme has a final sentence thus; “the first I shall produce will be one of Plato, which will be found of the greatest importance, as demonstrated by him. Paragraph 4; “If there be an area or field, whose form is a square, and it is required to set out another field whose form is also a square, but double in area, as this cannot be accomplished by any numbers or multiplication, it may be found exactly by drawing lines for the purpose, and the demonstration is as follows. A square plot of ground 10 feet long by 10 feet wide, contains an hundred feet; if we have to double this, that is, to set out a plot also a square, which shall contain 200 feet, we must find the length of a side of this square, so that its area may be double, that is 200 feet. By numbers this cannot be done; for if the sides are made 14 feet, these multiplied into each other give 196 feet; if 15 feet, they give a product of 225 feet”. Vitruvius has used this equation in Book 9, Prefaces, paragraph 6, where he discusses the staircase and it’s setting out via a 3:4:5 side ratio triangle, explaining it is a Pythagorean discovery. The preceding text has a very simple explanation as my diagrams illustrate. However, Vitruvius states that the hypotenuse of a square is hard to determine, in fact he states, “by numbers this cannot be done”. This is because the number required to solve the equation is in fact irrational, and supposedly cannot be written as an exact fraction. That however depends upon the accuracy of the calculation which is required to be carried out. In fact there are two fractions which will produce an accuracy of 2 and 8 decimal places, that are easily found by standard geometrical methods. The Greek mathematicians solved most mathematical problems by geometry, and although I am unaware of this solution written by Euclid, I find it hard to believe that so simple a fact was not established. I would state in defence of criticism that the figure of √2 is hardly ever used and may thus have been thought an unnecessary theorem. 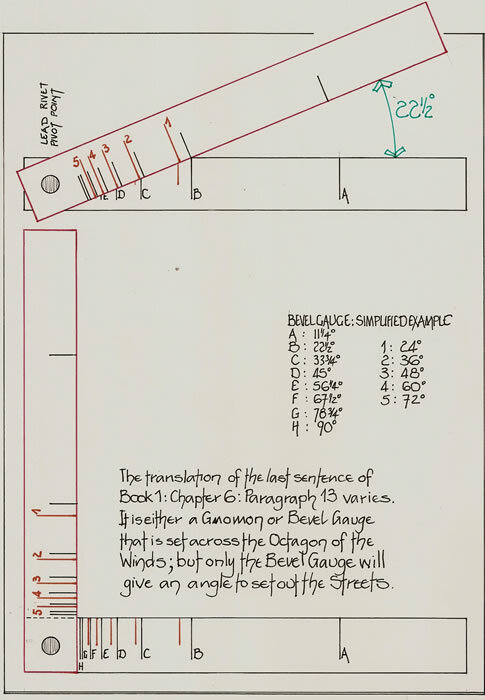 But let us examine the most basic unit of Roman land measure, the Actus Quadratus, which is 120 x 120 pedes and is set out by the 10 pedes or decampeda rod. Thus we can be certain that to survey this square the diagonal, the check line length would be a memorable distance capable of easy utilisation. In fact it is so very simple and is actually 170 pedes, which gives an accuracy of two decimal places as the mathematics illustrates. (120 x 120) + (120 x 120) = 28800, but (170 x 170) = 28900. Divide 28900 by 28800 and the resultant is 1.00347, i.e. correct to two decimal places (see RmVt1D32). This inaccuracy would have been quite hard for a Greek or Roman mathematician to perceive without the aid of geometry. (12 x 12) + (12 x 12) = (17 x 17) or 144 + 144 = 289, i.e. the spurious 1 intervenes, but it indicates how close the units actually are. Thus √2 may be given the credible ratio of 17/12, or 1.41667 against 1.414214. 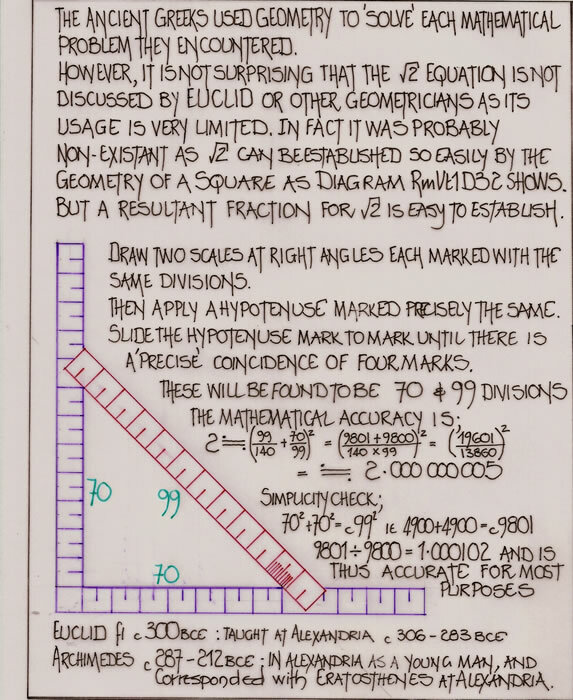 If we use a decampeda rod for the sides and diagonal and commence by laying the diagonal rod across the equivalent markers at the 70th marker the diagonal rod will read 99 exactly. I say exactly as the difference is imperceptible. Thus the fraction for √2 as 99/70 is more simply checked by, 992 divided by 702, answer, 2.00020482, and still stunningly accurate as an approximation! The ancients knew that the Π ratio was either 22/7 or 25/8. With √2 as 99/70 we have an immediate alignment of irrational numbers to indicate they are part of a singular system. Thus 99/70 = 9 x 11/7 x 10 and 22/7 = 2 x11/7 and can be inter-changed for each other in a mathematical calculation. 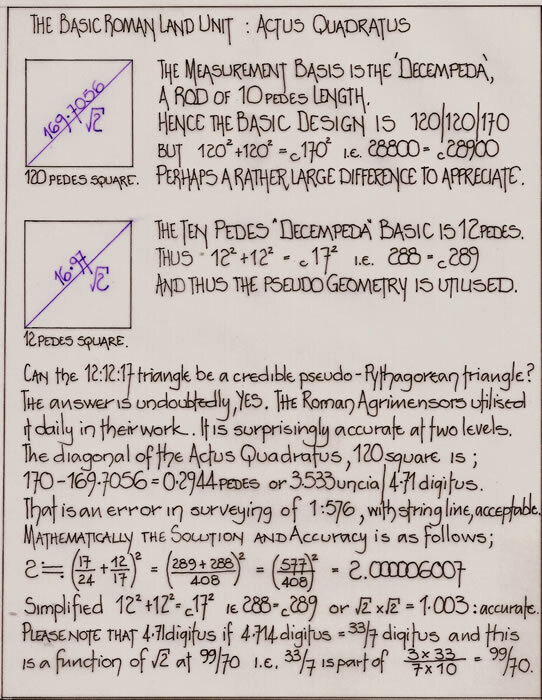 One glimpse at the work of Euclid (c300BCE) who taught at Alexandria during the reign of Ptolemy 1 (306-283 BCE) will indicate that this simple check to establish the ratio applicable to the square root of two would have been carried out. That it is hardly ever used is another story. The PI ratio was finally determined by Archimedes (287-212 BCE) when he published “The Measurement of the Circle”, stating, “The ratio of the circumference of any circle to its diameter is less than 22/7 but greater than 223/71”; i.e. 3.142857 or 3.140845, a difference of 0.002012. The average is 3.141851, less than a ten-thousandth error. The PI ratio was last recorded by Claudius Ptolemy (87-165CE) in Alexandria as 3 17/120, or more precisely 30 8’ 30” in sexagesimal notation which equals 3 + 8/60 + 30/3600 and is within 0.003% of the correct value. I find it extra-ordinary that the √2 unit ratio has not survived in its original geometric solution as 99/70. Paragraph 1; It is clearly by a divine and surprising arrangement , that the equinoctial gnomons are of different lengths in Athens, Alexandria, Rome, Piacenza, and in other parts of the earth, etc. It is not until we reach Chapter 7 that the gnomon lengths are explained. Paragraph1; from the doctrines of the philosophers above mentioned, are extracted the principles of dialling, and the explanation of the increase and decrease of the days in different months. The sun at the times of the equinoxes, that is when he is in Aries or Libra, casts a shadow in the latitude of Rome equal to eight ninths of the length of the gnomon. At Athens, the length of the shadow is three fourths of that gnomon. 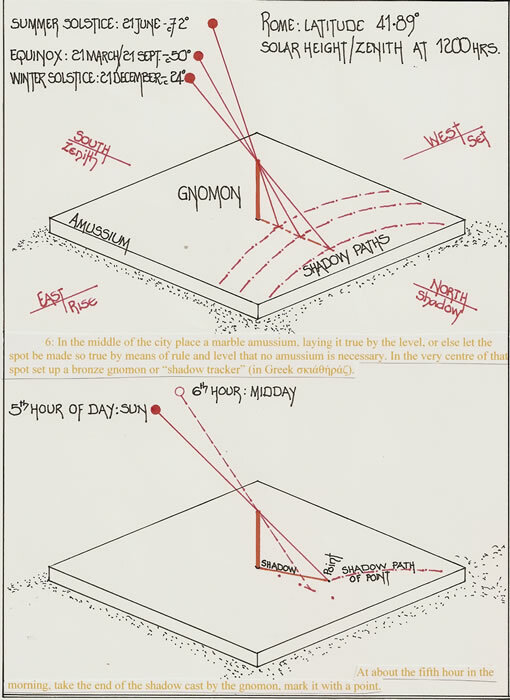 At Rhodes five sevenths; at Tarentum nine elevenths; at Alexandria three fifths; and thus at all other places the shadow of the gnomon at the equinox naturally differs. Paragraph 2; Hence in whatever place a dial is to be erected, we must first obtain the equinoctial shadow. If, at Rome the shadow be eight ninths of the gnomon, let a line be drawn on a plane surface, in the centre there-of is raised a perpendicular thereto; this is called the gnomon, and from the line on the plane in the direction of the gnomon, let nine equal parts be measured. Let the end of the ninth part A, be considered as a centre, and extending the compasses from that centre to the extremity B of the said line, let a circle be described. This is called the meridian. Paragraph 3; Then of those nine parts between the plane and the point of the gnomon, let eight be allotted to the line on the plane, whose extremity is marked C. This will be the equinoctial shadow of the gnomon. From the point C through the centre A let a line be drawn, and it will be a ray of the sun at the equinoxes. Then extend the compasses from the centre to the line on the plane, and mark on the left an equidistant point E, and on the right another, lettered I, and join them by a line through the centre, which will divide the circle into two semicircles. This line by mathematicians is called the horizon. Paragraph 4; A fifteenth part of the whole circumference is to be taken, and placing the point of the compasses in that point of the circumference F, where the equinoctial ray is cut, mark with it to the right and left points G and H. From these, through the centre, draw lines to the plane where the letters T and R are placed, thus one ray of the sun is obtained for the winter and the other for the summer. Opposite the point E, will be found the point I, in which a line drawn through the centre, cuts the circumference; and opposite to G and H the points K and L, and opposite to C, F, and A, will be the point N.
Paragraph 5; Diameters are then to be drawn from G to L and from H to K. The lower one will determine the summer, and the upper the winter portion. These diameters are to be equally divided in the middle at the points M and O, and the points being thus marked, through them and the centre A a line must be drawn to the circumference, where the letters P and Q are placed. This line will be perpendicular to the equinoctial ray, and is called in mathematical disquisitions, the Axon. 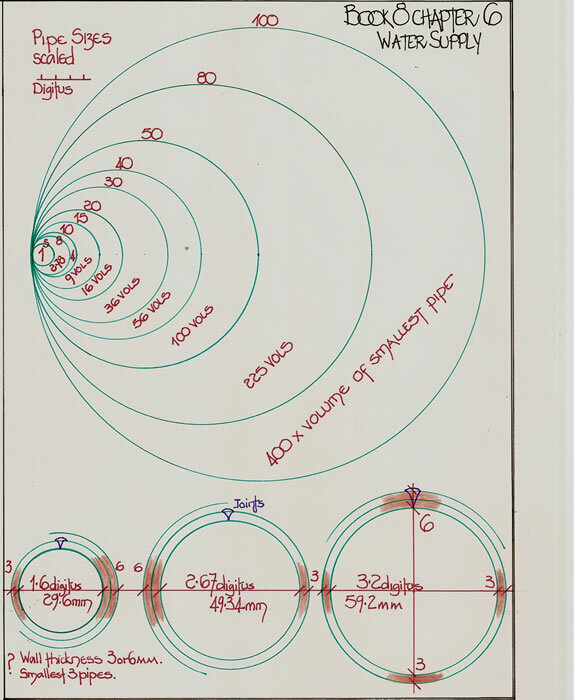 From the last obtained points as centres (M and O) extending the compasses to the extremity of the diameter, two semicircles are to be described; one will be for summer, the other for winter. Paragraph 6; In respect of those points where the two parallels cut that line which is called the horizon; on the right hand is placed the letter S, and on the left the letter V, and at the extremity of the semicircle, lettered G, a line parallel to the Axon is drawn to the extremity on the left, lettered H. This parallel is called LACOTOMUS. 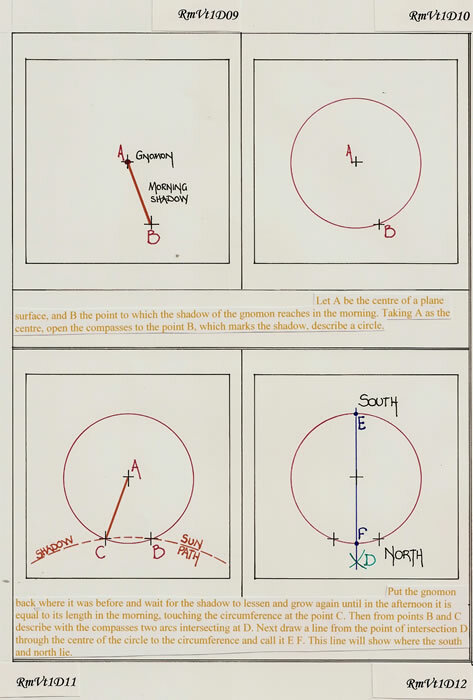 Finally, let the point of the compasses be placed in that point where this line is cut by the equinoctial ray, and letter the point X, and let the other point be extended to that where the summer ray cuts the circumference. And be lettered H. Then with a distance equal to that from the summer interval on the equinoctial point, as a centre, describe the circle of the months, which is called MANACUS. Thus will the Analemma be completed? Paragraph 7; Having proceeded with the diagram and its formation, then our lines may be projected on the Analemma according to the place, either by winter lines, or summer lines, or equinoctial lines, or lines of the months, and as many varieties and species of dials as can be desired, may be constructed by this ingenious method. In all figures and diagrams the effect will be the same, that is to say, the equinoctial as well as the solstitial days, will always be divided into 12 equal parts. These matters, however, I pass over, not from indolence, but to avoid prolixity. I will merely add, by whom the different species and figures of dials were invented; for I have not been able to invent a new sort, neither will I pass off the inventions of others as my own. I shall therefore mention those of which I have any information, and by whom they were invented. Paragraph 8; A list of persons who designed or constructed fixtures and fittings for everything. The error is 1011’, but in this instance could be seen as a miscopy for the Poleis of Patelia or Consenta which are at 400 28’. However Crotone on the coast at 390 05’ would give a creditable ratio of 9:11 under the circumstances. The ratio 3:5 is the most acceptable for all Poleis and may be deemed the most accurately recorded. It has been used by all of the ancient geographers. But before proceeding further it is worth noting the ratios which PLINY gives in his Natural History, 6/39. They are as follows; 7/4; 35/24; 100/77; 21/16; 7/6; 9/8 the region of Rome; and 35/36. Therefore although Pliny uses the same ratio as Vitruvius for Rome he does not specify its location. But more importantly the ratios are more varied and generally of a greater magnitude than those of Vitruvius. Thus we must question the fact that Vitruvius does not mention any Poleis with an erected gnomon for the populace to utilize when they are obviously erected in those places and particularly in Rome. Does Vitruvius understand what he has written, have the figures been sanitized or does Vitruvius believe that it is a given fact that the populace know of the gnomons and does not need to be specific. My text cgPl2 discusses the gnomons used, particularly their height which affects the accuracy of the measurements. Some are 70/80 feet high! The description given is a pure geometrical construct which has within its form the Tropics of Cancer and Capricorn as well as the Equator. The diagrams which follow are sequential and phased to the text sentences. These propositions form an appendix to this text. Thus the fifteenth part or 240 could possibly be set out either side of the “ray of sun at the equinoxes” by the use of a bevel gauge, if in fact it acted like a protractor with degree divisions. Thus the Analemma can be used to predict the length of day throughout the year at any given latitude. It would also suffice for a short distance north or south of its design latitude, but therefore should be constructed for each Polis. 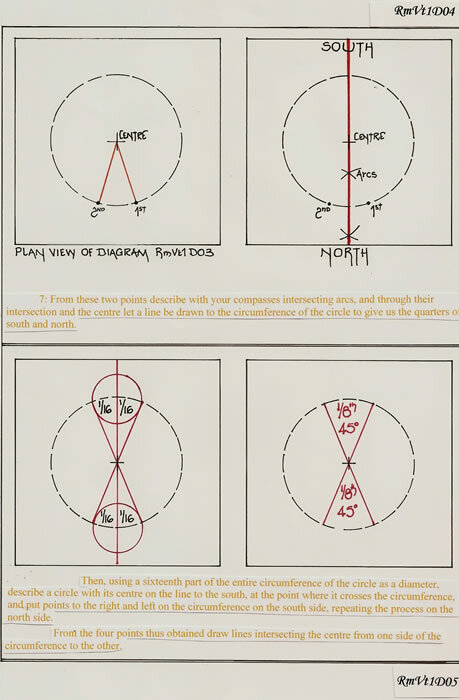 Diagram RmVt1D41 illustrates Analemma for the individual Poleis. In fact I find it amazing that Vitruvius did not mention the fact concerning the erection of gnomons in most Poleis for the use by the citizens and to regulate the hours for business etc. 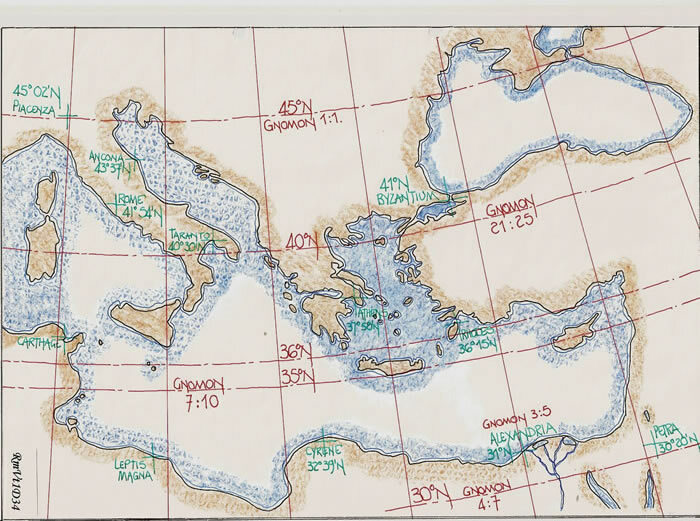 Returning to Chapter 1 and the list of places for equinoctial gnomons we were given the following; Athens, Alexandria, Rome and Piacenza, but in Chapter 7 we have Rome, Athens, Rhodes, Tarentum and Alexandria, with their corresponding (or nearly) gnomon ratios. Piacenza is at 450 2 ½’ north which is Cosine 0.706592 or a very near ½ x √2, ie 99/140. We could even contemplate it as ½ x 17/12 using the Roman field measurement ratio. Vitruvius has no doubt quoted standard text ratios for these places but a proper gnomon utilised at each site would have given a different reading. It would be reasonable to assume therefore that there was a list of the Poleis and their gnomon ratios. Pliny in his Natural History Book 6 chapter 39 lists many including “the region of Rome” as 8/9. But he also lists the length of the longest day for each and this is a pertinent fact unrecorded or even not mentioned by Vitruvius. Paragraph 1: In the famous and important Greek city of Ephesus there is said to be an ancient ancestral law, the terms of which are severe, but its justice is not inequitable. When an architect accepts the charge of a public work, he has to promise what the cost of it will be. His estimate is handed to the magistrate, and his property is pledged as security until the work is done. When it is finished, if the outlay agrees with his statement, he is complimented by decrees and marks of honour. If no more than a fourth has to be added to his estimate, it is furnished by the treasury and no penalty is inflicted. But when more than one fourth has to be spent in addition on the work, the money required to finish it is taken from his property. Paragraph 2: Would to God that this were also a law of the Roman people, not merely for public, but also for private buildings. For the ignorant would no longer run riot with impunity, but men who are qualified by an exact scientific training would unquestionably adopt the profession of architecture. Gentlemen would not be misled into limitless and prodigal expenditure, even to ejectments from their estates, and the architects themselves could be forced, by fear of the penalty , to be more careful in calculating and stating the limit of expense, so that gentlemen would procure their buildings for that which they have expected, or by adding only a little more. It is true that men who can afford to devote four hundred thousand to a work may hold on, if they have to add another hundred thousand, from the pleasure which the hope of finishing it gives them; but if they are loaded with fifty percent increase, or with an even greater expense, they lose hope, sacrifice what they have already spent, and are compelled to leave off, broken in fortune and in spirit. Paragraph 3: This fault appears not only in the matter of buildings, but also in the shows given by magistrates, whether of gladiators in the forum or of plays on the stage. Here neither delay nor postponement is permissible, but the necessities of the case require that everything should be ready at a fixed time – the seats for the audience, the awning over them, and whatever, in accordance with the custom of the stage, is provided by machinery to please the eye of the people. These matters require careful thought and planning by a well trained intellect; for none of them can be accomplished without machinery, and without hard study skilfully applied in various ways. Paragraph 4: Therefore, since such are our traditions and established practices, it is obviously fitting that the plans should be worked out carefully, and with the greatest attention, before the structures are begun. Consequently, as we have no law or customary practice to compel this, and as every year both Praetors and Aediles have to provide machinery for the festivals, I have thought it not out of place, Emperor, since I have treated of buildings in the earlier books, to explain in this which closes the treatise, the principles upon which such machines are constructed. It would be reasonable to opine that Vitruvius witnessed some of the problems he describes here-in, but also it would be reasonable to opine yet again that we read of his ire because he has not been so recognised and possibly used in his profession as he would have wished. Why, is conjecture, but there is a constant theme throughout the introductions to the books of a man who perhaps worked diligently but was never recognised as par excellence. I find it quite strange that the subject of cost control should be left to the last book and is in fact more a criticism of the Magistrates, Praetors and Aediles, the persons who would have employed Vitruvius than really of the private “architectes”. Is this a man who has a secure state pension finally stating the facts that he saw in his everyday life, when employed by those persons he now criticises. However the whole of Book 10 is a fascinating explanation of Roman technology much derived from the Greeks but exploited for all facets of Roman life. By carefully reading the whole text we can extract data that is factual and capable of being used for future analysis. But, we must be careful and cautious when generalising about the text. Non-technical persons could easily be misled by the text and consider it an encyclopedia, when in fact it is an anthology, a re-writing, a re-useage of original texts, some of which are clearly not fully understood. We must also remember much of the praise comes from the 16th and 17th centuries, by authors who had no comparative data with which to compare and ascertain the veracity of this text. However, it is a magnificent attempt and must be recognised as such, and used cautiously. M J Ferrar July 2011. Euclid, floriat c300BCE, was probably a pupil of Plato. He was older than Archimedes and no doubt studied his geometry and mathematics in Athens. His great work, the 13 books of the Elements is constantly referred to from the time of Archimedes, and was drawn from the works of his predecessors such as Eudoxus and Theatetus. The Arabs found that the name of Euclid, which they took to be compounded from ucli (key) and dis (measure) revealed the “Key of geometry”. They claimed that the Greek philosophers used to post upon the doors of their schools the well-known notice: “Let no one come to our school who has not learned the Elements of Euclid,” thus transferring the inscription over Plato’s Academy to all scholastic doors and substituting the Elements for geometry. GREAT BOOKS OF THE WESTERN WORLD; William Benton, Publisher; Encyclopaedia Britannica, Inc. University of Chicago, 1952. The 13 Books of Euclid and the Works of Archimedes were translated by Sir Thomas L. Heath. 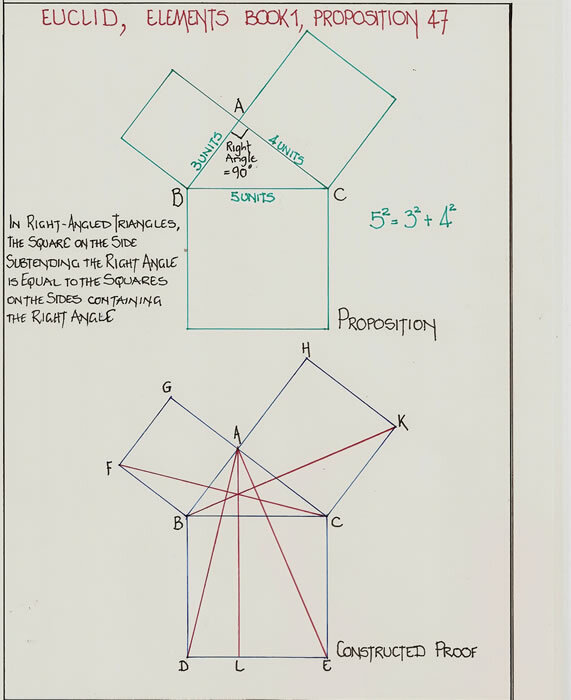 Within the text of Vitruvius there are several geometrical tasks which are required to be carried out. I do not intend to explore them all here-in, but have created another short paper in the miscellaneous section of this website with full disclosure of the methodology. The list and examples below indicate the knowledge required to fully understand the text of Vitruvius. Book 1, proposition 1; On a given finite straight line to construct an equilateral triangle. Book 1, proposition 10; To bisect a given finite straight line. Book 1, proposition 11; To draw a straight line at right angles to a given straight line from a given point on it. This is perhaps the most iconic of Euclid’s theorems, which we today express as A2=B22+C22. I say that the square on BC is equal to the squares on BA and AC. Through A let AL be drawn parallel to either BD or CE, and let AD, FC be joined. Then, since each of the angles BAC, BAG is right, it follows that with a straight line BA, and at point A on it, the two straight lines AC, AG not lying on the same side make adjacent angles equal to two right angles; therefore CA is in a straight line with AG. For the same reason, BA is also in a straight line with AH. Therefore the whole angle DBA is equal to the whole angle FBC. And, since DB is equal to BC, and FB to BA, the two sides AB, BD are equal to the two sides FB, BC respectively; and the angle ABD is equal to the angle FBC; therefore the base AD is equal to the base FC, and the triangle ABD is equal to the triangle FBC. Now the parallelogram BL is double of the triangle ABD, for they have the same base BD and are in the same parallels BD, Al. And, the square GB is double of the triangle FBC, for they again have the same base FB and are in the same parallels FB, GC. (But the doubles of equals are equal to one another). 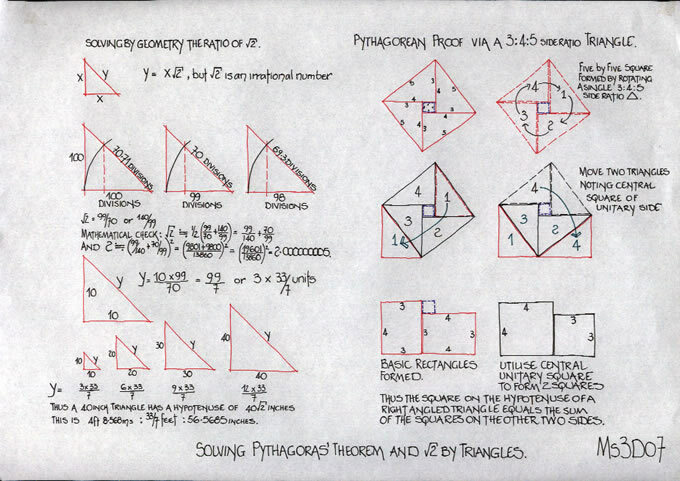 Therefore the parallelogram BL is also equal to the square GB. Similarly, if AE, BK be joined, the parallelogram CL can also be proved equal to the square HC; therefore the whole square BDEC is equal to the two squares GB, HC. And, the square BDEC is described on BC, and the squares GB, HC on BA, AC. Therefore the square on the side BC is equal to the squares on the sides BA, AC. Book 1, proposition 48; If in a triangle the square on one of the sides be equal to the squares on the remaining two sides of the triangle, the angle contained by the remaining two sides of the triangle is right. Book 4, proposition 10; To construct an isosceles triangle having each of the angles at the base double of the remaining one. Comment; this at first glance would seem not to be relevant to the work of Vitruvius. But, the angles are important and can be indicated thus. In any triangle the total of the three angles is always 180 degrees. Thus if we have two angles equal and the third half one of those angles we have a subdivision of 180 degrees by 5 parts, that is 180/5 = 36 degrees, and the three angle are therefore 72, 72, 36 = 180. When a circle is divided by 5 or a multiple of 5, this angle plays an important part. 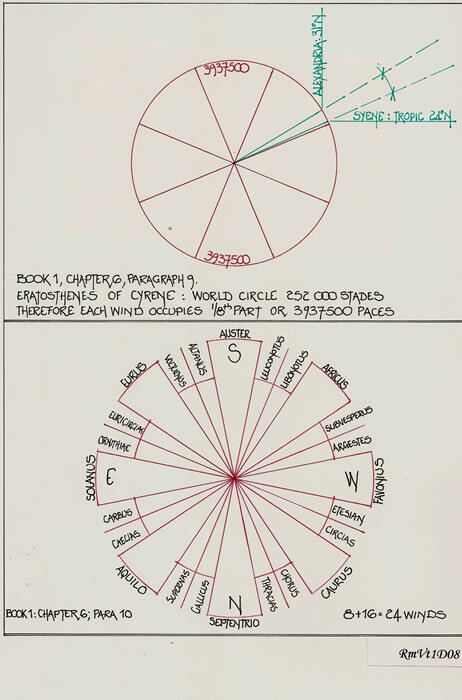 Vitruvius requires us to divide a circle into 15 parts, but does not indicate how. 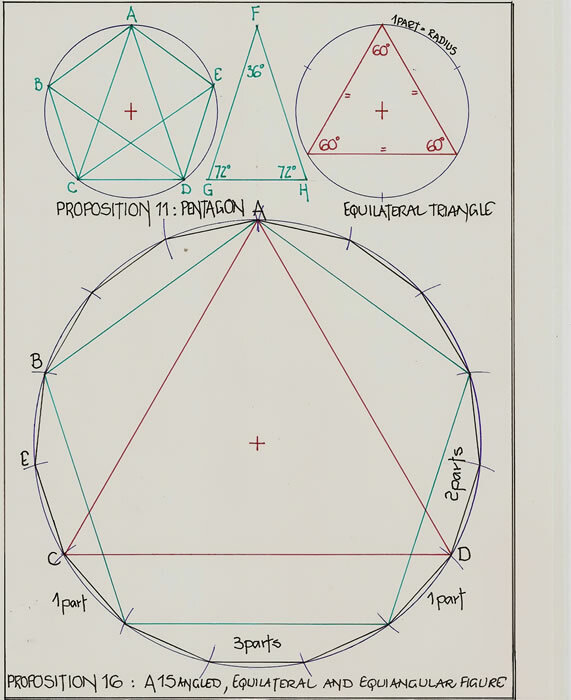 Book 4, proposition 11; In a given circle to inscribe an equilateral and equiangular pentagon. Let ABCD be the given circle; thus it is required to inscribe in the circle ABCD a fifteen-angled figure which is both equilateral and equiangular. 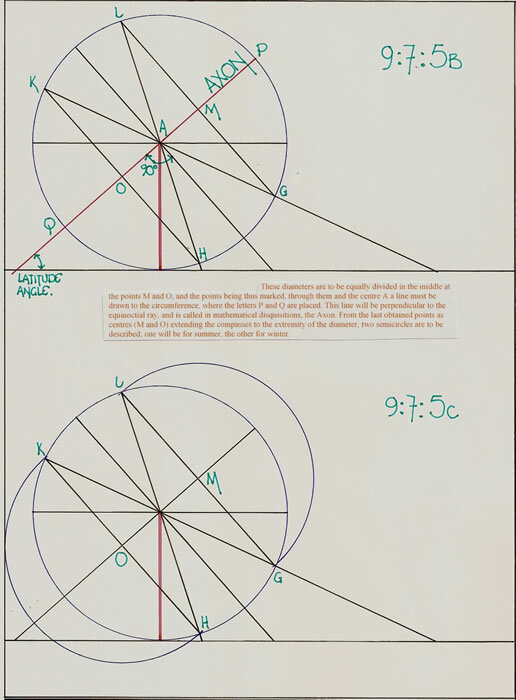 In the circle ABCD let there be inscribed a side AC of the equilateral triangle inscribed in it, and a side AB of an equilateral pentagon; therefore, of the equal segments of which there are fifteen in the circle ABCD, there will be 5 in the circumference ABC which is one third of the circle, and there will be 3 in the circumference AB which is one fifth of the circle. Therefore, in the remainder BC there will be two of the equal segments. Let BC be dissected at E; therefore each of the circumferences BE, EC is a fifteenth of the circle ABCD. If therefore we join BE, EC and fit into the circle ABCD straight lines equal to them and in contiguity, a fifteen-angled figure which is both equilateral and equiangular will have been inscribed in it. Lacus Curtius; A Dictionary of Greek and Roman Antiquities, by William Smith, D.C.L., LL.D. ; originally published by John Murray, London, 1875. Vitruvius, 10 books on Architecture; edited by Ingrid D. Rowland and Thomas Noble Howe, published by Cambridge University Press, 1999.